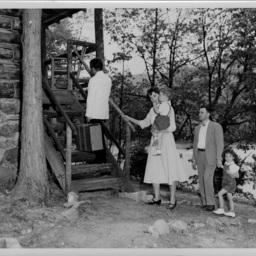 Photograph taken by William Hoyle Garber showing what appears to be a family entering a cabin. 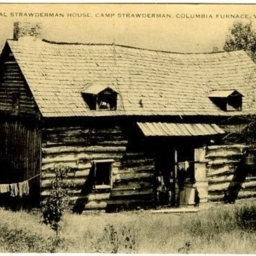 Postcard with an image of a cabin at Camp Strawderman which is an all girls camp located near Columbia Furnace in Shenandoah County Virginia. Card notes the cabin is the original Strawderman House. 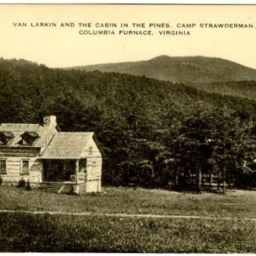 Postcard with an image of two cabins at Camp Strawderman which is an all girls camp located near Columbia Furnace in Shenandoah County Virginia.. The card identifies them as Van Larkin and Cabin in the Pines. 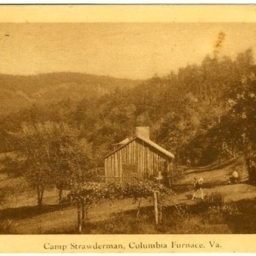 Camp Strawderman, Columbia Furnace, Va.
Postcard with a photograph of a cabin at Camp Strawderman which is an all girls camp located near Columbia Furnace in Shenandoah County Virginia. 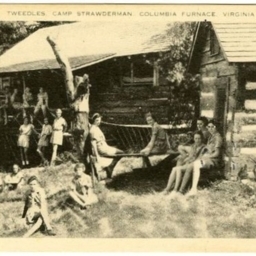 Postcard with an image of a cabin and girls at Camp Strawderman which is an all girls camp located near Columbia Furnace in Shenandoah County Virginia. 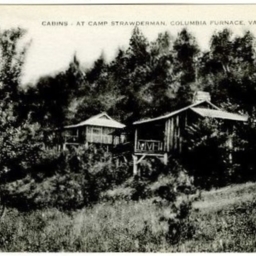 Postcard with a picture of cabins at Camp Strawderman which is an all girls camp located near Columbia Furnace in Shenandoah County Virginia. 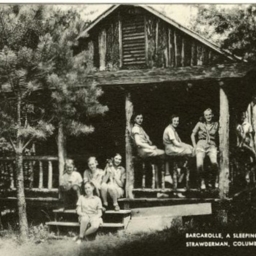 Barcarolle, A Sleeping Cabin At Camp Strawderman, Columbia Furnace, VA.
Postcard with a picture of girls at "Barcarolle" a cabin at Camp Strawderman which is an all girls camp located near Columbia Furnace in Shenandoah County Virginia.